“The current Closing the Gap Refresh process has again highlighted the need for Governments to ensure effective engagement with Aboriginal and Torres Strait Islander organisations and communities. Together we can make informed decisions about creating sustainable and positive change. 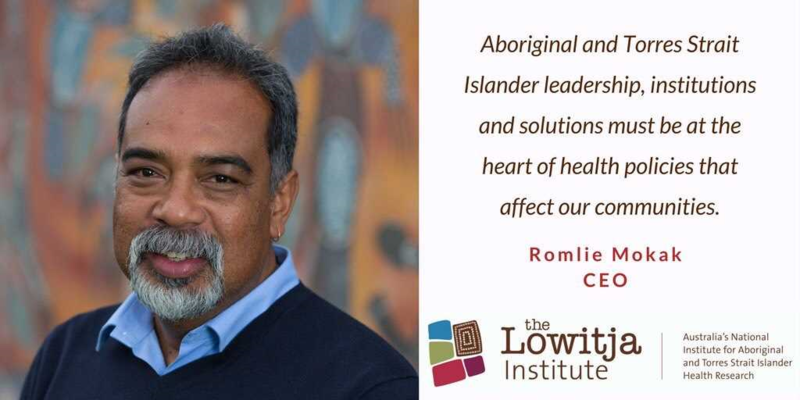 Romlie Mokak, CEO of the Lowitja Institute. 2. Study Question: What would it take to address Family Violence in Aboriginal and Torres Strait Islander Communities? Aboriginal and Torres Strait Islander leadership in health research and evidence-based policy is critical to closing the gap for Australia’s First Peoples’ health. 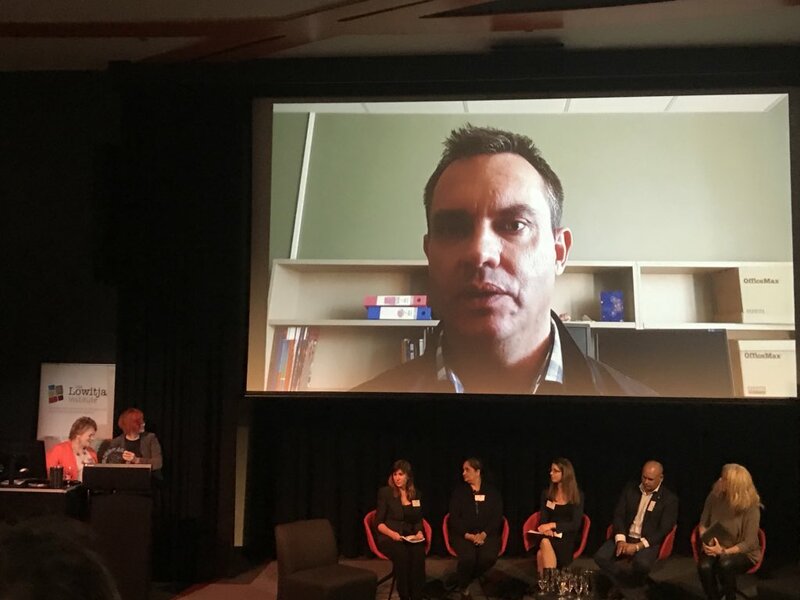 A Community priorities into policy forum was held in Canberra Monday highlighting three research projects to inform strategic decisions in policy development, service delivery and evaluation. These projects reflect Aboriginal and Torres Strait Islander community priorities, and were commissioned and funded by the Lowitja Institute. Governments need increased focus and collaboration with Aboriginal and Torres Strait Islander organisations and communities to grow the knowledge and evidence base, and face future challenges in holding mainstream health organisations to account. “Each of the projects discussed at this forum contribute to an emerging body of research on the value of engaging Aboriginal and Torres Strait Islander people in every stage of health research,” Mr Mokak said. 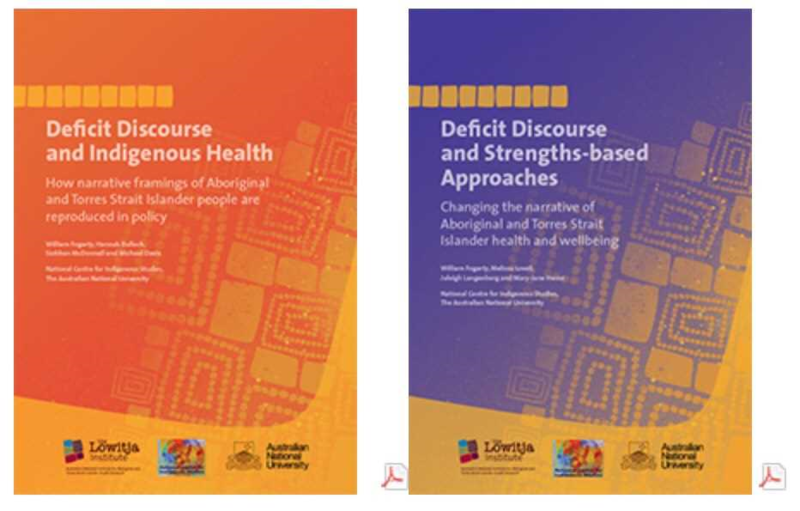 “Discourses of deficit occur when discussion of Aboriginal and Torres Strait Islander affairs is reduced to a focus on failure and dysfunction, and Aboriginal and Torres Strait Islander identity becomes defined in negative terms, eclipsing the complex reasons for inequalities, and overlooking diversity, capability and strength,” Dr Hannah Bulloch from National Centre for Indigenous Studies said. Professor Margaret Kelaher from the University of Melbourne will argue that the potential benefits of programs for Aboriginal and Torres Strait Islander people are not being fully realised due to limitations in how evaluations are being conducted, what is being evaluated, and how the evidence generated is being translated into action. She will present an evaluation framework to improve the benefits of evaluation for Aboriginal and Torres Strait Islander people. Information about evaluation tenders for Aboriginal and Torres Strait Islander health programs is locked away by governments, according to a new research report. A review of publicly advertised evaluation tenders over the past ten years found that only five percent of tender documents and 33 percent of evaluation reports were publicly available. 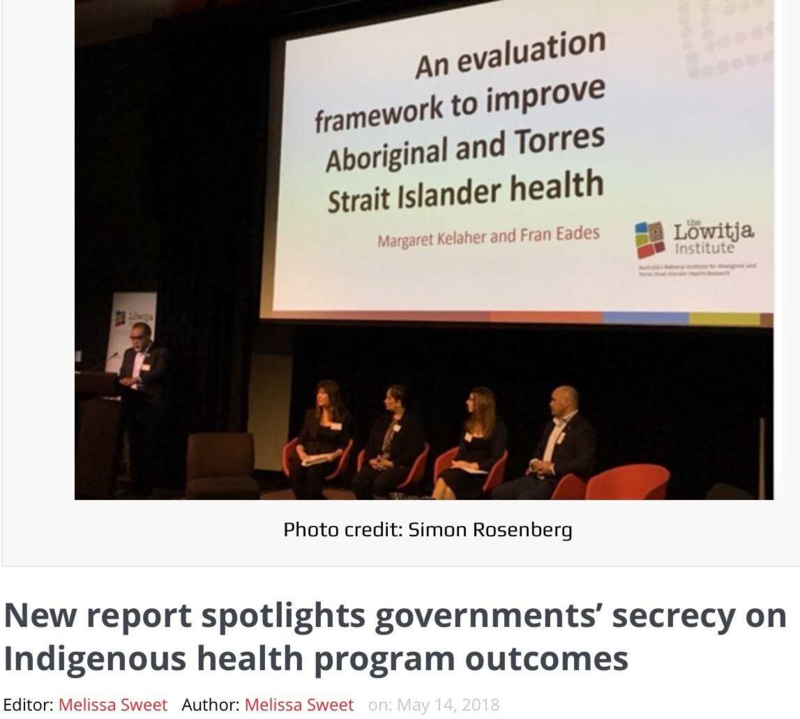 The report, An Evaluation Framework to Improve Aboriginal and Torres Strait Islander Health, makes sweeping recommendations to improve the transparency and accountability of evaluations, as well as the quality of tender processes. Prepared for the Lowitja Institute by the University of Melbourne’s Margaret Kelaher, Joanne Luke, Angeline Ferdinand and Daniel Chamravi, the report is one of a number of new publications launched at a Community Priorities into Policies forum, convened by the Lowita Institute in Canberra today. Follow #ResearchIntoPolicy for live tweeting of the discussions, which are being covered by UTS scholar and Croakey contributing editor Dr Megan Williams for the Croakey Conference News Service. The report calls for tender documents, evaluation reports and responses to evaluation to be stored on a publicly accessible database, so they are accessible to the communities in which data are collected. It also calls for sweeping reforms to evaluation of Aboriginal and Torres Strait Islander health programs to ensure they better meet the needs of communities and follow the principles of ethical research. The researchers said the failure to release evaluation reports was a frustration not only for evaluators, Aboriginal and Torres Strait Islander people, and program implementers – but also commissioners. “The value of releasing evaluation reports was recognised by all parties,” the report said. “Although decisions not to release evaluation reports are typically made by commissioning agencies, these decisions often reflect political rather than program imperatives. The researchers said the Department of the Prime Minister and Cabinet was moving to release all evaluations in either report or summary form, but that past evaluations should also be released. The report noted that evaluation contracts, particularly around intellectual property, are often at odds with community expectations and ethical frameworks. The report also found that, although there were some positive examples, accepted principles for working with Aboriginal and Torres Strait Islander people are not widely or consistently integrated into programs, tender documents or program evaluations. For example, principles of holistic concept of health, partnerships and shared responsibility, cultural respect, engagement, capacity building, accountability and governance were not well integrated into evaluations. “It was not uncommon for a program to stipulate that its outcomes were related to holistic health but then have indicators that were largely biomedical,” the researchers reported. The report proposes a framework for the evaluation of policies, programs and services for Aboriginal and Torres Strait Islander peoples, noting that the lack of a coherent framework has meant “a reduction in the quantity, quality, scope and use of available evidence”. While efforts were underway to improve evaluation processes, the researchers said it was recognised that systemic change was required. They called for tender processes to support evaluation proposals that are most likely to benefit Aboriginal and Torres Strait Islander people, and for evaluation contracts and agreements to be consistent with principles for working with Aboriginal and Torres Strait Islander people and ethical frameworks. A directory of current evaluations should be developed, and training should be provided to specifically support Aboriginal and Torres Strait Islander leadership in evaluation, the researchers said. The report gives several examples of positive approaches to evaluation, but notes that “the most constant criticism from Aboriginal and Torres Strait Islander communities about evaluation and other types of research is that the findings are not translated into action and thus not of benefit to communities”. For example, many of the issues examined in the Royal Commission into the Protection and Detention of Children in the Northern Territory arose from unaddressed recommendations in the 2007 Little Children are Sacred report and the 1991 report of the Royal Commission on Aboriginal Deaths in Custody. A project led by the Secretariat National Aboriginal and Islander Child Care will be presented by Professor Kerry Arabena, also from the University of Melbourne. The project looks at service delivery integration initiatives targeted to the early childhood development needs of Aboriginal and Torres Strait Islander children. The Australian National University is seeking partnerships with Aboriginal and Torres Strait Islander communities to conduct research to find out what communities need to promote and improve safety for families. We want to partner and work with local organisations and communities to make sure the research benefits the community. We work at the Australian National University (ANU). 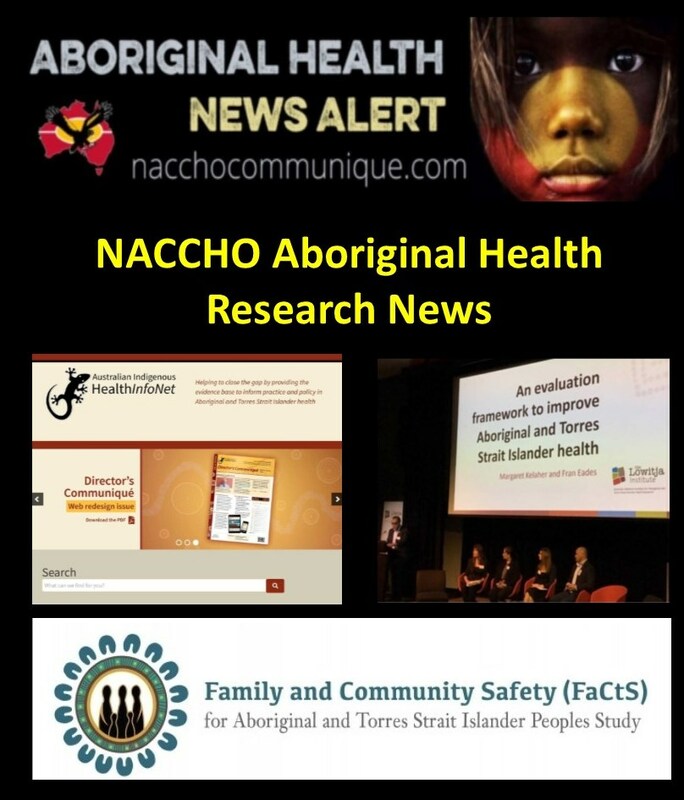 The study is led by Aboriginal and Torres Strait Islander researchers. Professor Victoria Hovane (Ngarluma, Malgnin/Kitja, Gooniyandi), along with Associate Professor Raymond Lovett (Wongaibon, Ngiyampaa) and Dr Jill Guthrie (Wiradjuri) from NCEPH, and Professor Matthew Gray of the Centre for Social Research and Methods (CSRM) at ANU will be leading the study. Study Question: What would it take to address Family Violence in Aboriginal and Torres Strait Islander Communities? How are we going to gather information to answer the study question? A Community Researcher (who we would give funds to employ) would capture the data by interviewing 100 community members, running 3 focus groups for Men / Women / Youth (over 16). We would interview approx. 5 community members to hear about the story in your community. We know Family Violence happens in all communities. We don’t want to find out the prevalence, we want to know what your communities needs to feel safe. We will also be mapping the services in your community, facilities and resources available in a community. All this information will be given back to your community. What support would we provide your service? We are able to support your organisation up to $40,000 (including funds for $30 vouchers), this would also help to employ a Community Researcher. Community participants would be provided with a $30 voucher to complete a survey, another $30 for the focus group, and another $30 for the interview for their time. What will we give your organisation? We can give you back all the data that we have captured from your community, (DE identified and confidentialised of course).We can give you the data in any form you like, plus create a Community Report for your community. There might be some questions you would like to ask your community, and we can include them in the survey. How long would we be involved with your community / organisation? How safe is the data we collect? The data is safe. It will be DE identified and Confidentialised. Our final report will reflect what Communities (up to 20) took part in the study, but your data and community will be kept secret. Meaning, no one will know what data came from your community. If you think this study would be of benefit to your community, or if you have any questions, please do not hesitate to contact Victoria Hovane and the FaCtS team on 1800 531 600 or email facts.study@anu.edu.au. 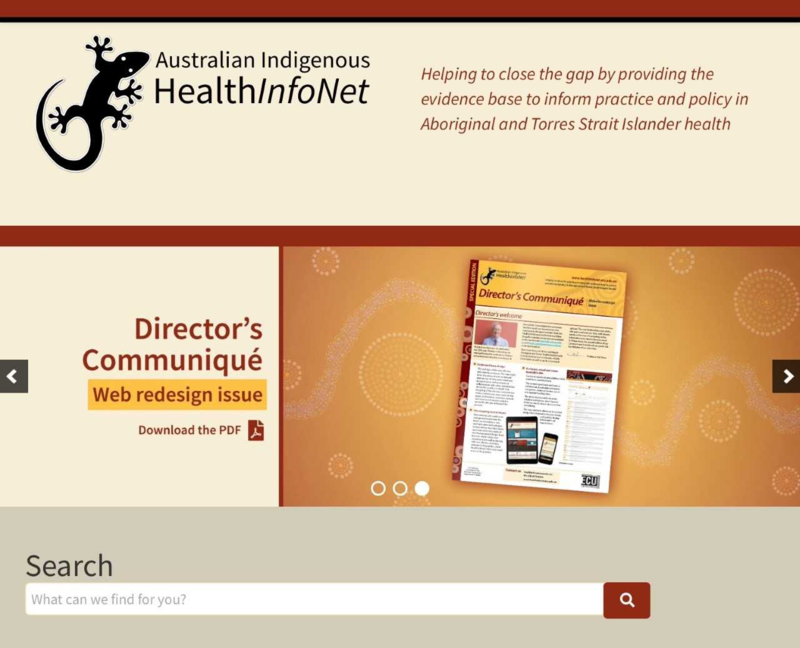 The Australian Indigenous HealthInfoNet this week launched a new responsive design website. The HealthInfoNet has been bringing together the latest information, evidence, research and knowledge about Aboriginal and Torres Strait Islander health in one place and making it freely accessible for over 20 years. A comprehensive custom built database and re design of the front of the web resource means that the new responsive design will support the workforce more than ever before, on any platform in any location. HealthInfoNet Director, Professor Neil Drew, says ‘Now more than ever those working in Aboriginal and Torres Strait Islander health need prompt access to relevant, reliable information as well as quick, easy search options. Our new evidenced based responsive design has been the result of in depth review of site mapping and analytics, a national user survey of what users want and access most and extensive collaboration with users and other stakeholders across the country. This has resulted in the design of a cleaner, visual and more accessible site which can now be accessed on any platform be it a tablet or mobile phone”. Renae Bastholm, HealthInfoNet IT Manager who developed the responsive site said ”The content you know and trust is still there, but a simpler and easier navigation will mean a shorter search time to get to what you need and a quicker loading time. We have structured the new site to be intuitive so our users don’t have to think too much about navigation. The new platform allows us to custom design the information to our users’ needs and quickly display information”. “The real dividend” says Professor Drew “is that for a site of this size and a national user base with diverse needs, is the ease of getting directly to the information you need when you need it. This supports the time poor health workforce and ensures the relevant information gets to where it’s needed most. Updating the site and utilising the latest technology to meet users’ needs is an ongoing focus”. Both the HealthInfoNet and the Alcohol and Other Drugs Knowledge Centre are now available in this new format. www.Aodknowledgecentre.ecu.edu.au (note new location).